On Sunday, July 10, 2016, a Prayer Gathering was held in Forsyth Park. In light of the recent killings of Alton Sterling in Baton Rouge, La. ; Philando Castile, in St. Paul, Minnesota and the 5 police officers shot down in Dallas, Texas, several local pastors along with members of the Savannah community gathered in Forsyth Park to pray for the families of the deceased as well as a healing for our city and throughout our nation. Rev. John Ruehl, Pastor of Montgomery Presbyterian Church on Ferguson Ave. saw the violence in our country and the growing unrest and division growing rapidly throughout the nation and decided to reach out to local pastors in the Savannah community to gather for prayer and share their concerns. Rev. Ruehl, who is new to the Savannah community, hopes that this gathering will serve as a springboard for future discussion, collaboration and consideration on how we can work together. He believes that Pastors in the community should live up to a call in scripture when Paul writes about unity in the body. “ I would like to cross denominations and differences in faith traditions in order to address the needs of our community together,” said Rev. Ruehel. .Rev. Da’Henri Thurmond, Sr., Pastor of St. Paul CME and Rev. Andrew Young, Pastor of New Covenant Church collaborated with Rev. John Ruehl in reaching out to the Savannah community. Rev. Quentin J. Morris, Sr. and Rev. Paul Sheppard, as well as other ministers, participated in the gathering to bring family and friends together for prayer. 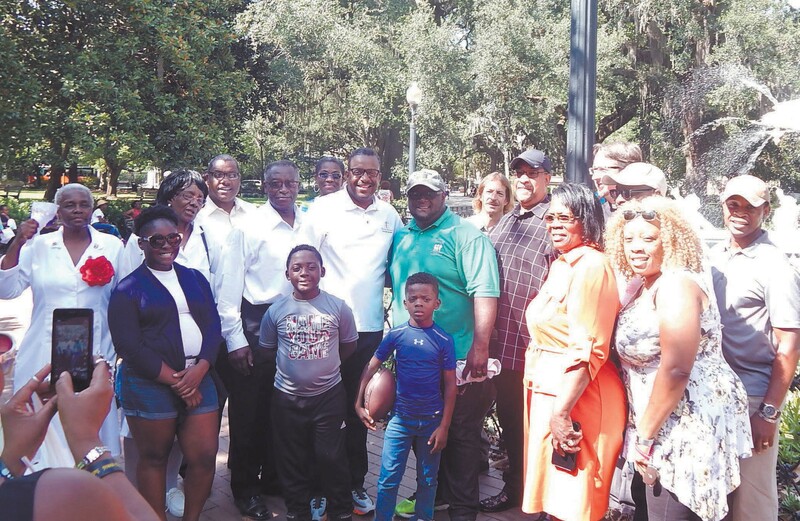 There were other prayer vigils held throughout the Savannah community including “Savannah Lives Matter” who met at First African Baptist Church on Franklin Square. Also “Black Lives Matter” Marchers took to Savannah City Hall with anger and frustration of the latest killings of two black men at the hands of police offi- cers. “These men had families to raise, they had more work to do, but now they are seeds in the ground and I have to confess, like you, I am tired of black men and black women becoming hashtags,” says local pastor Jomo Johnson. “Coming together, coming together as one and just to unite, I love this; I always wanted to see this. I think this is what Martin Luther King, Malcom X, all of them would’ve wanted us to do this,” says Raheem Manley who took part in the vigil and march.